We offer a variety of services to make sure your lawn is the envy of the neighborhood. You may actually want to warn your neighbors beforehand because distracted driving is a proven side affect of JB's Landscaping Lawn Care...okay that's not true, but it will look good! Lawn Maintenance: Our lawn mowers are specially equipped with striping kits which roll the grass behind the mower deck leaving your lawn with the desired alternating light and dark line appearance. Our crew also knows to switch these lines every week because it is better for the growth of grass and will not leave ruts of repetitive mowing with the added aesthetic benefit. Weed whacking and blowing grass off of sidewalks, driveways, and the road are also included in the Weekly Special Lawn Maintenance Package. 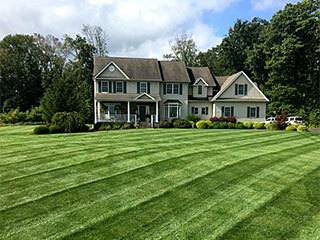 [Click here] to see all of the Lawn Maintenance Packages. Party Cuts: If you are having a party at your house and want us to make your lawn look extra special, we offer the option of a Party Cut. We will cut the lawn twice in opposite directions and bag up all the grass clippings so no one will track grass into your house or pool during your party. This service is sure to “wow” all of your guests on the big day. This package is the most comprehensive and it comes with a free soil test (an $80.00 value). To put things more clearly, the 7 Point Treatment will make even the unhealthiest of lawns into an oasis of plush green grass. [Click here] to view all Fertilizing Packages. Dethatching, Aerating, and Over-seeding: Similar to the fertilizer treatments, we will come out and assess your lawn either visually or with a soil sample if necessary. Dethatching - This initial step removes the layer of thatch that is sitting above the soil and producing brown spots in your lawn. The thatch is then removed using the vacuum systems on our mowers. Aeration - We will then aerate your entire lawn. This process involves removing small plugs of grass, which exposes the soil to more air. See more benefits to aeration below. Over-seeding - Finally, we will spread new grass on your lawn to promote consistent and deep-rooted growth.